This vividly hued brassica is generally in season from September until December, and is many people's idea of a staple side dish during the colder months. It can be served raw, adding colour and crunch to winter salads and coleslaw, or braised, boiled, steamed or even pickled depending on what you prefer. 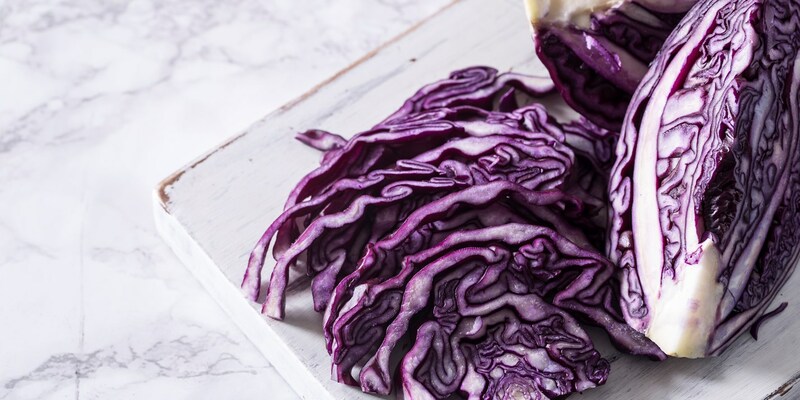 The secret to cooking perfect red cabbage is adding a little vinegar to the water – this will preserve the deep purple colour of the leaves, preventing them from turning blue. Take a look at our guide on how to cook red cabbage for more advice on selecting and preparing the vegetable. Andy McLeish incorporates red cabbage into a delicious coleslaw in his Marinated chicken recipe, perfect for the last few barbecues of the summer. Paul Welburn's autumnal venison recipe pairs a vibrant red cabbage gel with pickled beetroots, blackberries and Port-laced salsify, while Nigel Haworth uses pickled red cabbage to add colour and flavour to his signature Lancashire hotpot recipe. Red cabbage can make a fantastic addition to the Christmas dinner table, with any leftovers beautifully dressing a plate of cold cuts the following day – see Alyn Williams' Boxing Day turkey toastie for a fantastic approach to Christmas leftovers. Andy Waters' Braised red cabbage recipe is infused with flavours of red wine and juniper and is perfect paired with the rich flavours of duck in his Braised duck leg recipe, or try serving it alongside pork – such as Mark Dodson's Pork belly with apple and red cabbage – for a dish fit for a Danish Christmas feast.